Please note that all dates and times are subject to change. Please check often. 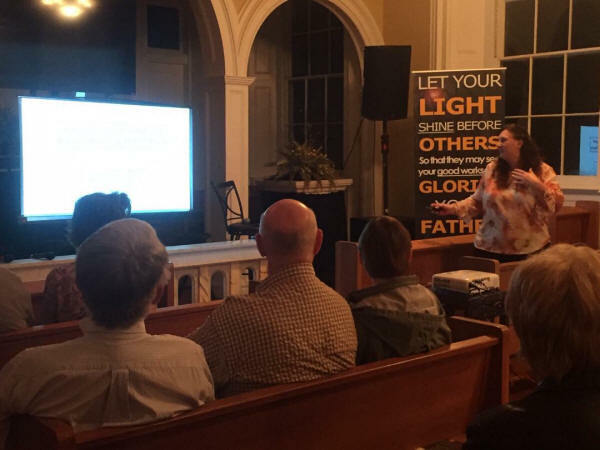 Dr. Lisa Marie Malischke, Professor of Anthropology at Mercyhurst University, Eire, Pennsylvania, presented at the Southern Cultural Heritage Center about her dissertation on French Fort Saint Pierre. Dr. Malischke’s research synthesizes all the earlier historic and archaeological work at the fort, some of which had not been previously published. Her thorough research develops new interpretations on the culture and life ways of this important French and Indian Period National Historic Landmark. Thursday evening, April 11, 7 p.m.
Mrs. Angela Diez, volunteer docent at the Historic New Orleans Collection, will present at the Southern Cultural Heritage Center in Vicksburg. The subject of her presentation will be the fascinating story of her seventeen-year-old fourth great grandmother Catherine Notas who witnessed the slaughter of her husband, mother, stepfather and sister but miraculously escaped when over 200 French at Natchez and Fort Rosalie were massacred. Mrs. Diez has researched the existing literature on this horrific event. In contrast, the massacre at Fort Saint Pierre involved only 10% of those killed or captured at Fort Rosalie. Tuesday evening, May 7, 6:30 p.m.
Mr. Terrence Winchel, retired Park Historian at the Vicksburg National Military Park and author of several works especially on the Vicksburg Campaign, will speak on the 1862 -1863 fortifications that were a part of the War Between the States archaeological component of the Fort Saint Pierre National Historic Landmark. The private-party land and the state land at Fort St. Pierre represent the only effectively protected portion of the nine mile salient of Yazoo River extensive fortifications, currently under severe threat from vandalism, looting, logging and development. Concert in the National Military Park by the Mississippi Symphony Orchestra, under the direction of Mr. Crafton Beck, will present a musical program that includes music composed by Georg Philip Telemann, who was commissioned in 1720 by the Frankfurt Stock Exchange to write music that advertised investment opportunities in the new but ultimately ill-fated French Gulf Coast Colonies. Fort Saint Pierre was a failed example of this speculation scheme. Thursday evening, 13 June, 7 p.m.
2019 Mr. James Barnett, retired Director of the Mississippi Department of Archive and History, Museum of the Grand Village in Natchez and author with a special research interest in Mississippi Indians, will present at the Southern Cultural Heritage Center, throwing light on the Indian side of the Fort Saint Pierre story, especially the complex interaction of Native American groups and the Europeans of the Gulf Coast colonies. Thursday evening, July 11, 7 p.m.
Mrs. Gail Buzhardt, retired teacher, author and historian with special research interest in the French Gulf Coast colonies, will present at the Southern Cultural Heritage Center, Vicksburg on the social, political, and economic factors of the Fort Saint Pierre story.